Performance Lab Sleep: What does it do? In our opinion, there is no better sleep supplement on the market than Performance Lab Sleep. It is an all natural sleep supplement designed to give you a much better night’s sleep. But, how exactly does it do that? Less muscle twitches and spasms – Reduces impulses from your nervous system to give you a longer, undisturbed sleep. Sleep more consistently – Regulates overnight functions to enforce a more regular and satisfying sleep schedule. No morning grogginess – Have better mornings with more energy to start your day in a more productive way. At the price of $40 a bottle, it’s one of the more expensive options out there on the market, but we believe it’s well worth it. In this report, we’ll be looking at who makes this supplement, the science behind the ingredients and our thoughts on how it may (or may not) be the choice for you. 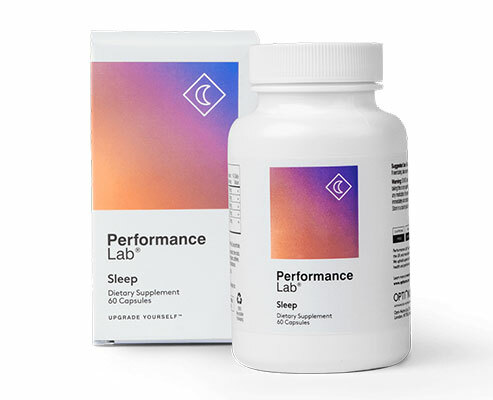 1 Performance Lab Sleep: What does it do? 2 Who is it supposed to help? 3 Who makes Performance Lab? 5 Performance Lab Sleep Side Effects – Is it safe to use? 6 How do you take it? 7 Is there any way to improve Performance Lab Sleep? 9 Where can you buy it? Who is it supposed to help? People who want a natural, and effective alternative to prescription sleeping pills. And more. It relaxes your body, your mind and balances your hormones in a way that promotes sleep. This is also the most effective supplement we’ve seen at doing this too, and this mainly comes down to the dedication of the manufacturer. In the next section you’ll learn more about them, and why Performance Lab works so well. Performance Lab is a supplement range owned by Opti-Nutra, a British company founded in 2015. They have a strong empahsis on two things: Cleanliness and Quality. That isn’t just a claim for marketing either, we did the research and found Opti-Nutra have the most dedication to a pure product that we’ve seen in any supplement company. To give you an idea of what we mean, Performance Lab is made in FDA-approved facilities and made to cGMP standards (Current Goods Manufacturing Process). That’s an impressive list. Not only that, all the supplements are free from soy, egg, fish, shellfish, dairy, peanut, tree nuts, wheat, or any other nutrient prone to causing allergic reactions. They’re also non-GMO, non-irradiated, gluten-free, caffeine-free and have no synthetic additives, artificial colors, preservatives or banned substances. The list, just keeps going. It’s rare to see something like this. As for the quality, Performance Lab even have their own range of organically grown ingredients – known as their BioGenesis range. Essentially, they make these ingredients as identical to nature as they can. Not only that, all their products are protected by a 30 day guarantee. If you try it and don’t like it, you can send it back for a full refund. 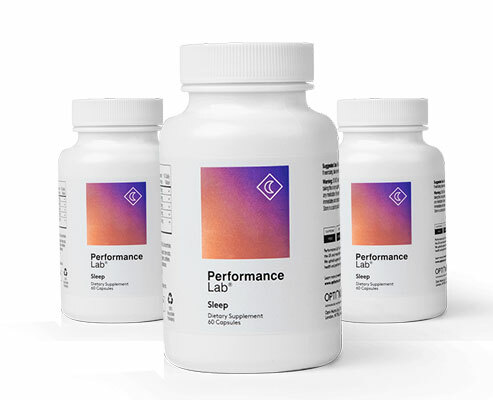 Unlike most other supplements aimed at sleep, Performance Lab only has 3 ingredients. High quality ingredients, with a lot of research behind them. No filler. Just what works, and solid dosages of each one. One of the main way it works is by helping to promoting your overall levels of melatonin, which is your body’s sleep regulating hormone. It’s the best supplement we’ve seen of this type, it’s well-balanced and effective. When it comes to promoting sleep, you’d be surprised how much a dose of magnesium can do. It’s a mineral that helps with your nervous system, which matters a lot when it comes to sleep. 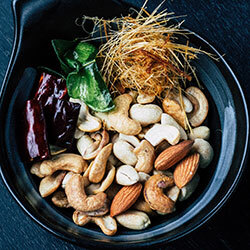 Supplementing a healthy amount of magnesium can help to reduce impulses across your muscles. This helps prevent twitches overnight which could wake you up. Unlike other natural sleep supplements, you’re not just getting one form of Magnesium – but three. Bisglycinate is magnesium with glycine. It carries the same benefits for sleep as normal magnesium, but it also improves overall absorption as the glycine protects magnesium from your stomach acids. The Taurate on the other hand is mangesium combined with taurine. This helps to improve your overall levels of GABA which is the relaxation chemical in your brain. This helps you get your brain into a sleep-ready mood much faster. Finally, the Biogenesis Magnesium is Performance Lab’s own and the cleanest we’ve seen. 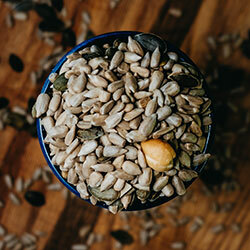 It is grown on lab-cultured probiotics and made identical to the magnesium that occurs in nature. Naturally grown, with additionally bioavailability allowing you to absorb as much as possible. As we’ve mentioned Melatonin is your body’s sleep regulating hormone. It’s been dosed here to deliver enough for a healthy night’s sleep without the morning grogginess. Other sleep supplements usually use synthetic melatonin which may not be as effective. 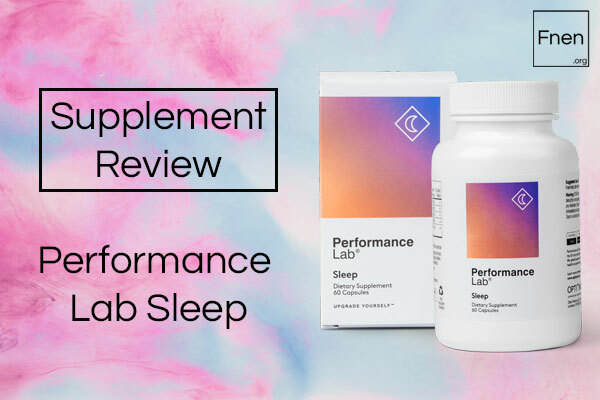 However, Performance Lab Sleep uses CherryPURE which contains all natural melatonin, and is concentrated to give the beneficial equivalent of eating 25g of tart cherries. The final ingredient in Performance Lab Sleep, and a great finisher to this supplement. L-Tryptophan is an amino acid which can have a noticeable impact of restful sleep through chemical reactions in your brain. After absorption, L-Tryptophan is converted into 5-HTP and converts again into serotonin. Serotonin is your body’s feel-good hormone and promotes a better mood, less stress and gives you a more relaxed outlook. It is then again converted (much like the Tart Cherries) into Melatonin which regulates sleep. Overall it’s a huge mood booster and sleep promoter by giving you a better state of mind and a more desirable hormonal balance. Unlike other sleep supplements, the ingredients in here have synergy with one another. In this case, the L-Tryptophan and Magnesium work together. Magnesium can help with L-Tryptophan’s conversion’s to Serotonin. 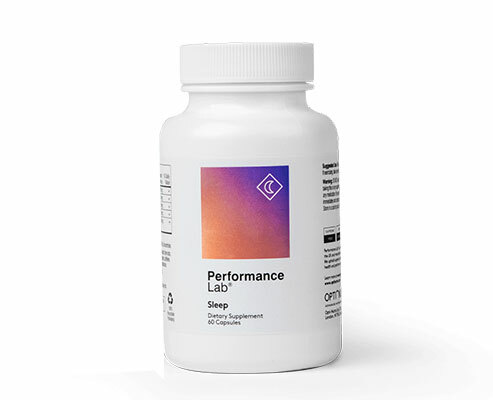 Performance Lab Sleep is all science and no filler. With only 3 ingredients it fulfills all the staples needed for a better night’s sleep. Supplementing it can help improve mood, reduce muscle twitches which could disturb your night and boost your overall levels of the sleep hormone melatonin. Performance Lab Sleep Side Effects – Is it safe to use? It’s the safest we’ve seen. There are only three ingredients and they’re all completely natural. You shouldn’t run into any side effects from supplementing this sleep aid. That said, we can’t speak for everyone. We advise that you check with your doctor before using it, and ensure you don’t have any preexisting conditions. Again though, we can’t put enough emphasis on how clean this supplement is. All Performance Lab supplements are free of GMOs, gluten, soy, colorants, preservatives and other additives. They’re also vegan and contain no allergens. It’s simple. One serving with water around 60 minutes before you go to bed. Performance Lab recommend 2 – 4 capsules for the best results. Is there any way to improve Performance Lab Sleep? The essentials are definitely there, however, if you think you need more support we may recommend taking a multivitamin with this. Performance Lab have design their products so that they can all be stacked together. Performance Lab have formulated two whole-food multivitamin stacks. One for men and one for women. 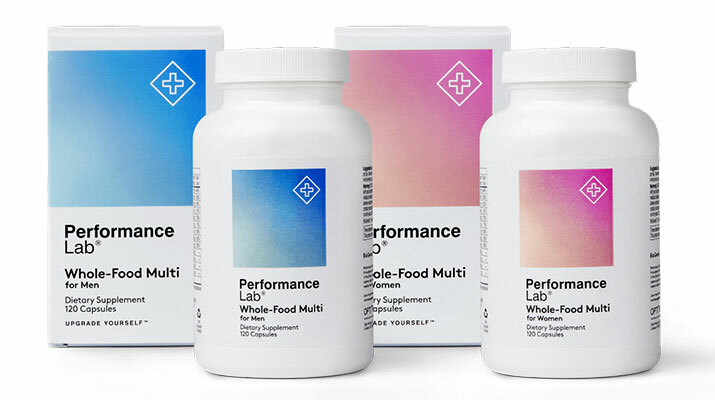 Performance Lab® Whole-Food Multi also augments Performance Lab® Sleep’s magnesium, offering additional mineral support for sleep-enhancing muscle and nervous system relaxation. If you want the full details, you can find more about this supplement here. It’s definitely something consider if you want more universal health benefits. 1. Safe for everyone – Performance Lab is completely vegan, made in FDA-approved facility and has numerous credentials to make it as accessible as possible. 2. Backed by science – There are studies to support each of the ingredients in this supplement. 3. 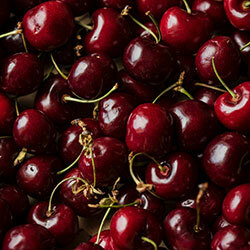 Natural melatonin – Nothing synthetic, you get an effective amount of the sleep hormone from the Tart Cherries. 4. Deeper, longer sleep – Optimize your mood and hormones for a better night’s sleep. 5. Reduced muscle twitches and jerks – Magnesium can help to lower overnight muscle impulses which may twitch you awake overnight. 6. 30 Day Money Back Guarantee – If you don’t feel like you’re seeing the results you’re looking for, you can send it back for a full refund after using it for 30 days. 7. Stacks well with other ingredients in the range – Performance Lab has superb stack-ability through all their supplements, if you have any other goals or want to improve Sleep’s effects, it’s a great brand to use. As we’ve mentioned at the start of this evaluation, it’s $40.00 a bottle. However, we should mention that you get a 5% discount if you buy 2 bottles, and 10% off if you buy 3. Performance Lab also ship worldwide and offer free shipping on orders over $200. Again, for more info, everything you need is on the Performance Lab website.